You now have the ClaroRead Chrome Extension in your browser. You can use it to read back web pages, PDF files, and Google Docs files. If you have the Premium version you can also capture text from the screen! Click in a web page or PDF file or Google Docs document, then click the Play button. ClaroRead will read back the text from that point with highlighting so you can follow along. Or just select some text and it will be read out for you. If you have the Scan from Screen button click it and select an area of the screen with the mouse and it will be read aloud. You can also tint web pages and PDF files so they are easier for you to read, and get word prediction to help you write. 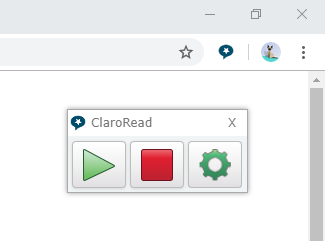 You can turn this on in the ClaroRead Chrome settings - just click on the ClaroRead Chrome icon in the Google Chrome window.